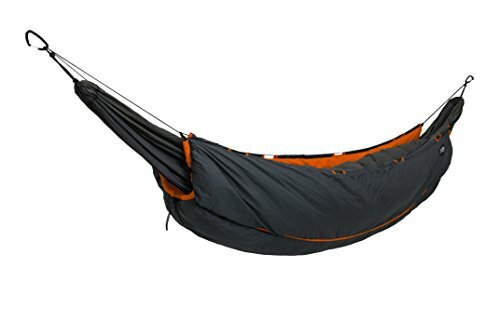 In search of the best hammock underquilt to keep warm while hammock camping? Hammocks are a great piece of gear for just hanging out during the day or sleeping overnight while camping. 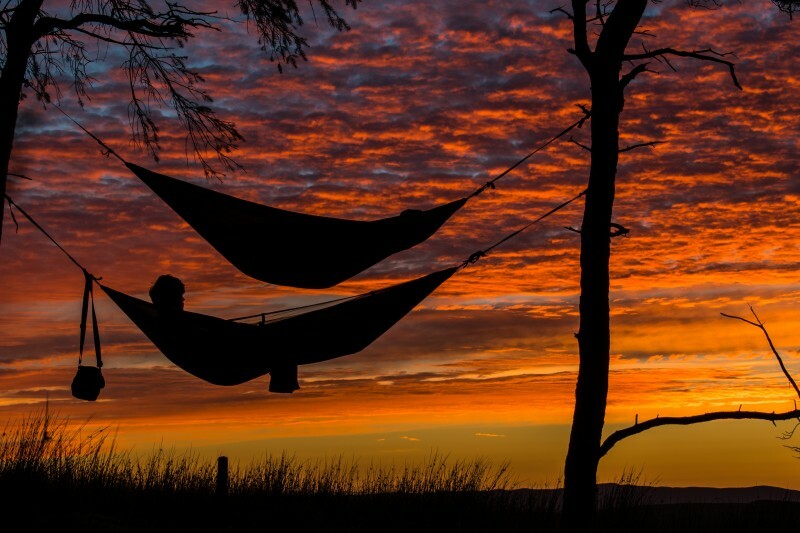 When hammock camping during the summer or in warmer climates, you can often get away with just a top blanket. But, if you’re going to be hammock camping in colder temperatures or during the winter you’ll want to invest some extra gear to stay warm during the night. Hammock underquilts are built to insulate you from the bottom, where hammocks lack any sort of insulation. When you laying in a hammock you are essentially exposed on the underside. Sleeping pads and a sleeping bag can make do, but if you’re looking for an upgrade and ultimate warmth, then a hammock underquilt is what you’re after. They are much more versatile and comfortable than using a sleeping bag in a hammock. Once you invest in a hammock underquilt you’ll never be cold again and wonder why you even tried to sleep without one. What Is A Hammock Underquilt? Hammock underquilts are the ideal piece of gear to use for sleeping in a hammock in colder temperatures. They are designed to keep you warm and cozy in even the coolest temperatures and you can find hammock underquilts in a wide array of temperature ratings. Here is a list of a few of the best hammock underquilts on the market to help you choose the right one. There are a lot of nice underquilts on the market, but the ENO Blaze Underquilt is a serious contender when it comes to the best hammock underquilt. Eagle Nest Outfitters is by far the most established brand producing some of the best hammock camping gear. 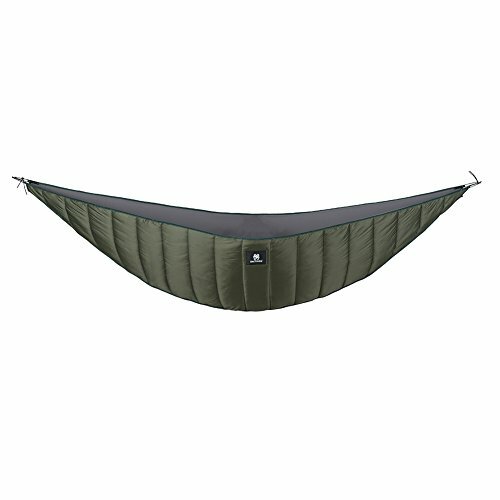 They offer a wide selecting of high quality gear and this ENO underquilt is no exception. If you’re after the ultimate hammock underquilt to keep you warm in even the chilliest conditions, the ENO Blaze delivers just that. It’s warm enough to be used any time of year and even the winter. Insulation is provided by high quality 750 down filling and the quilt is rated down to 30-40°F. 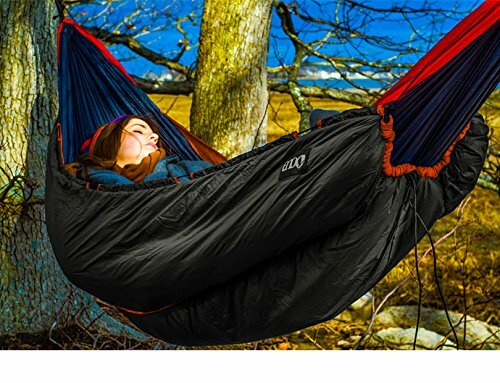 It’s full length coverage is designed to keep you snug in your hammock without any gaps. The differentially cut design with integrated shockcord suspension do a great job at adjusting to the contour of the hammock. On this ENO underquilt ripstop nylon shell is resistant again abrasion and tears, plus it has a DWR finish to repel light rain and snow. If you’re going to be in wet conditions you’ll want to also use a hammock tarp to provide ultimate protection from above. For packing up the ENO Blaze can be compressed into it’s nylon compression stuff sack and stored in your pack. 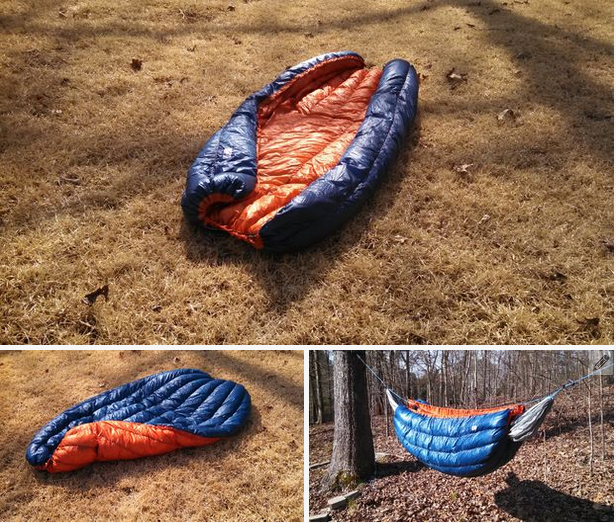 Another great option from Eagle Nest Outfitters is the ENO Vulcan Underquilt. With it’s Primaloft® Synergy Continuous Filament Insulation it provides warmth even in the coldest conditions. 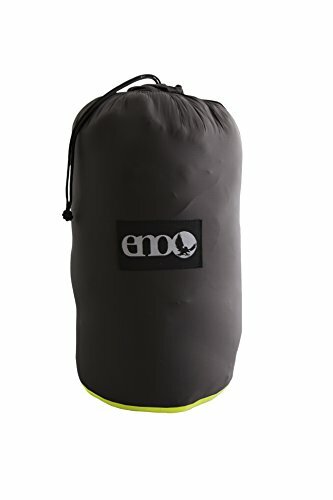 This ENO underquilt is designed to be used as a four-season underquilt and rated down to 35-45 ºF. It’s considered equally as warm as the ENO Blaze Underquilt, but offers synthetic insulation. Primaloft® Synergy is an incredible synthetic insulating material and much more effective at keeping you warm when it gets wet (vs. down filling). It’s also very packable and stuffs down to a small size in its nylon stuff sack. The Vulcan ENO underquilt does a good job at keeping drafts out with it’s differentially cut construction and shockcord suspension. ENO’s differentially cut construction just means that the inner shell fabric is cut narrow than the outer lay, creating a wrapping cocoon shape that contours your body. Wherever you’ll be camping, the Vulcan Underquilt will keep you warm from head to toe with it’s full length size. Setting it up is easy, they hardest part is just getting out of your cozy hammock in the morning. OneTigris is known for making some of the highest quality tactical gear on the market. The OneTigris Hammock Underquilt is there first underquilt, but it stands up to their reputation of making high-quality and affordable. This underquilt is rated down to 40°F which makes it a great choice for a three-season model. It’s lightweight at 26 ounces and packs down to just 13″ x 8″ making it easy to carry while backpacking or traveling. It comes with a nylon stuff sack for easy storage options. The insulation used on the OneTigris underquilt is SEE® Polyester Filling, which I’ve never used before it should perform similary to PrimaLoft. As a four-season underwuilt the ENO Ember 2 Under Quilt is your best bet for warmth on a budget. 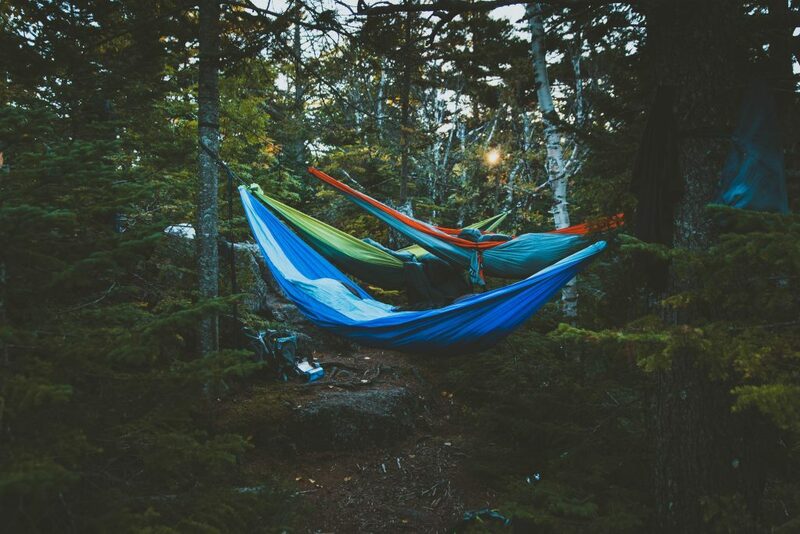 ENO (Eagle Nest Outfitters) is known as the largest camping hammock gear brand out there. They produce a wide range of high-quality hammocks and accessories, include underquilts. The polyster-filled Ember 2 is designed with a temperature rating down to 50°F which is enough for most nights during cooler summer nights and shoulder seasons. For colder temperatures you can use it in combination with a light sleeping bag for extra warmth. It’s built with an universal fit to accommodate all hammocks. With it’s shockcord you can easily adjust the underquilt to fit the shape of your body in the hammock. Overall is one of the easiest and quickest underquilts to get set up, but I’d recommend doing a test fit in your yard before heading out camping. For weather protection the underquilt features a nylon shell w/DWR finish to shed moistere. You can always retreat the DWR after it wears offer to maintain it’s water resistance. If you’re looking for a solid and well-designed hammock quilt on a budget, the ENO Ember 2 Under Quilt is your best bet. Another great budget option is the Snugpak Hammock Under Blanket. Although it’s heavier than all other models compared, it can be a nice option for the weekend warrior or casual hammock camper. SnugPack also makes the SnugPack Cocoon insulation system, which is an interesting take on the underquilt. 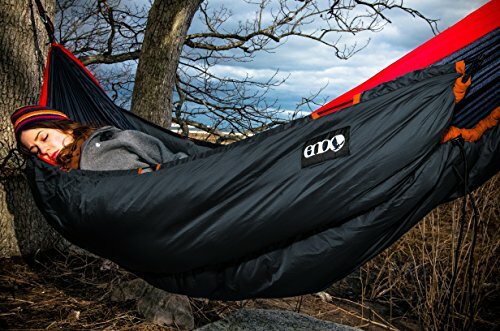 This system wraps completely around you while in the hammock providing exceptional warmth for hammock insulation, but is more cumbersome to setup and get in and out of. 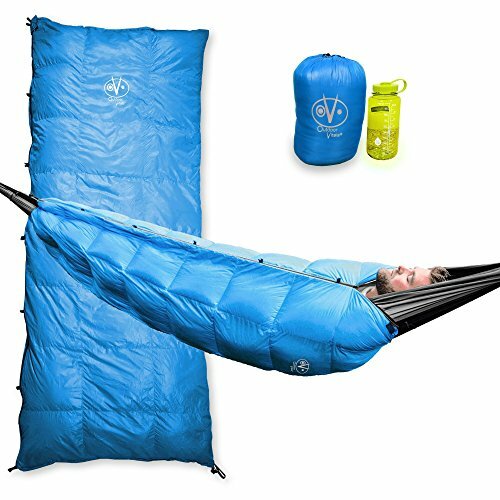 If you are looking for the most packable hammock underquilt the Outdoor Vitals Aerie 30°F Down Underquilt is a top contender. It’s extra lighweight and packable with a compressed size of just 9 x 7 inches when packed in it’s included stuff sack. This is thanks to it’s 800+ fill power down insulation, which keeps you warm, yet is super compressible. 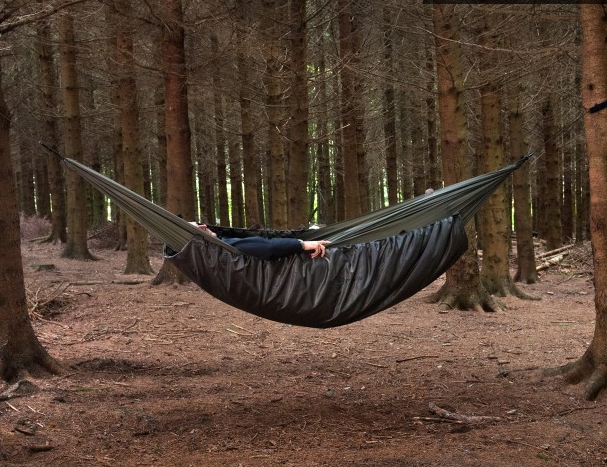 This hammock underquilt has a interesting design and actually serves more than just one use. 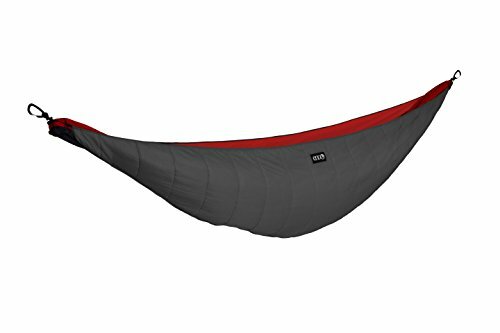 It is designed to function as a underquilt for hammock insulation, plus a technical blanket, pod system, sleeping bag, and even a double sleeping bag when two are combined. Built to last it features high quality materials and components including YKK zippers, lightweight ripstop nylon fabric, and a DWR coating to repel water. It’s suspension kid and zipper features create a tight contour around your body when you hang in your hammock. I really like the concept of this underquilt and the fact that it can be used in variety of situations—from tent camping to hammock camping. It also comes with a nice manufacture warranty in case something goes wrong with your gear. The Outdoor Vitals Aerie is rated down to 30°F and includes a built-in drawstring to synch the bag right up around your chest and face in super cold conditions. The bags unique cocoon design insure that there are no cold spots from drafts, but this may also be more constricting then traditional underquilt designs. There are a lot of great hammock underquilt options out there and many people have their favorites. If you are looking for a proven design that will keep you warm in even the coldest conditions one of my favorites is the ENO Vulcan Underquilt. It’s a great all-around quilt for hammock insulation and built to last. A hammock underquilt is essentially a sleeping bag made specifically for hammocks. It fits on a hammock but wrapping around the outside (and underside) of the hammock while you are laying it. It works by creating an insulating layer on the underside of your hammock, where you typically lose a lot of heat. Similar to lightweight sleeping bags, the best hammock underquilts are incredibly light and compressible. Most models pack down to the size of a small water bottle, which makes it easy to carry them in your pack. By creating an airy insulating layer on the underside of your hammock they create a space of dead air, in turn keeping you warm and away from cold night temperatures. The best models use down or PrimaLoft insulation, which are both lightweight and extremely effective at insulating. If your a fan on hammock camping and want to enjoy sleeping outdoors all-year round, then grabbing a underquilt is the way to go. They are a huge upgrade from sleeping bag and pad combinations and a clear winner as the best option for hammock insulation. Sleeping pads can help you sleep warmer in a hammock, but most are a nuisance and move around when you are sleeping at night. This can be incredibly annoying and although there are some good options, I have yet to find a fail-proof pad design that works well in a hammock. As far as sleeping bags go, when you use a sleeping bag in a hammock the bottom side of the bag gets compressed, making it much less effective at insulating. This is where hammock underquilts shine since they remain uncompressed on the outside of your hammock. For warm while hammock camping underquilts are unbeatable. For one they attach around the exterior of your hammock, so you almost won’t know they are there. They are incredibly comfortable and there is no problem of getting twisted up in them, like you would in a sleeping bag when turning at night. They work better than sleeping bags since they remain uncompressed, providing you ultimate warmth throughout the night. 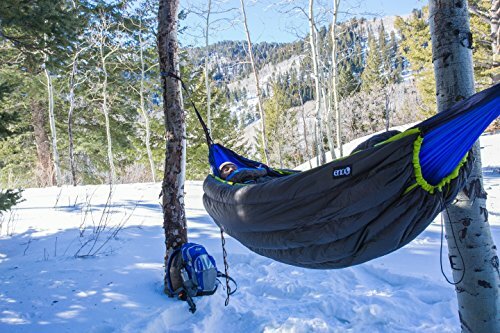 Hammock quilts can keep you warm even in the coldest temperatures. Some models, such as the Outdoor Vitals Aerie 30°F Down Underquilt and ENO Vulcan Underquilt are rated down to ~30°F. As far an comfort goes, they are most serious hammock users preferred choice. Since they are specifically designed to fit around a hammock they are built to not get in the way and wrap the hammocks shape. Plus, you can easily access you hammock and get in and out during the night without having to hassle with an enclosure. You’ll also want to consider getting a hammock tarp if you will be sleeping your hammock extensively. This way you’ll not only be cozy, but protected from wind, rain, and snow if it happens to fall during the night. If you are really looking to get the cheapest underquilt there are numerous DIY hammock underquilt ideas out there. If you have some basic sewing skills or the patience to learn, this can be a great option for the budget oriented hammocker. 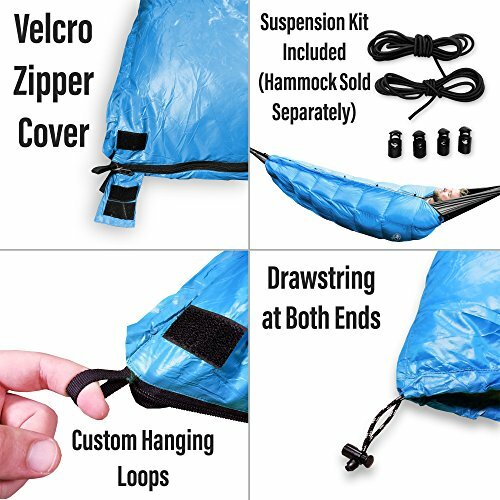 The basis of creating a DIY hammock underquilt is first to grab a down fill comforter and sew in a suspension system to hold the hammock around your while your hanging. The advantage of building your own is that you can customize it as you like including the length and width, suspension type, baffle style and height, overstuff, down fill power, materials, etc. The best hammock underquilts are made from durable ripstop fabric and ideally have a water repellent coating such as DWR. Having a ripstop nylon shell ensure maximum durability and protection against snags and tears. Since you’re sure to run into some type of moisture while out hammock camping, having a Durable Water Repellent coating provides protection by shedding water. Depending on what you’re after and what conditions you’ll use your gear, you can find hammock underquilts in with both synthetic and down fill insulation. Both provide a great type of hammock insulation and ultimately it comes down to personal preference. I’m a huge fan of down filled sleeping bags since the weight to warmth ratio is hard to beat. However, for hammock underquilts I can go either way. A high quality polyester insulation, such as PrimaLoft or similar, provides ultra warmth and won’t loose it’s heating capacity if it gets wet. An important factor when choosing the right underquilt is to get a model that fits your hammock. Some models run longer and wider than others. Take this into consideration if you sleep in a double camping hammock or just want a little extra wiggle room while sleeping. To provide maximal hammock insulation you want to make sure that the hammock underquilt is large enough to fit you comfortably when you are laying in your hammock. You don’t want it to be too snug so it limits your movement, but on the other hand you don’t want any gaps where heat will escape during the night. Obviously all other things constant—the lighter, the better. Lightweight gear is easier to carry and pack, so you’ll want to consider the weight of the hammock underquilt. The lightest models range from mid 20 ounces and heavier models run around 50 ounces. If you value having lightweight gear or plan to haul your hammock camping gear around the globe on your adventures, then you’ll want to opt for a lightweight model. You’re back will thank you later. Do you plan on using your camping hammock in the alpine backcountry? In the Fall? Winter? Depending on what seasons you plan on using your hammock you’ll want to look for a hammock rated down to lowest temperatures. Hammock underquilts are very versatile and allow you to sleep comfortably in a wide range of temperatures. If you plan on sleeping in colder temperatures than the quilt is rated you can add layers on top, or even use a sleeping bag in combination to stay warm. With any travel and outdoor gear you buy, you want it to last. Buying from a trusted brand that stands behind their products is often the way to go. A quality hammock underquilt should last for years to come with the proper care. For durability you’ll want to buy a underquilt with ripstop fabric and high-quality seams. The most likely cause of damage is a tear in the fabric by snagging it on something sharp. Underquilts are generally made in a simple rectangle shape with a shockcord suspension that allows adjustability to form a contour around your body. The most important factor for keeping warm is eliminating gaps between the hammock and underquilt. A gap will allow a draft and eliminate the insulating effect. Not all underquilts will fit perfectly with all camping hammocks. Be sure to read up a bit on which underquilts fit well with which hammock models. That said a underquilt that is large enough to fit you hammock and is well-designed should be able to be adjusted to work with your hammock. If you plan on sleeping in your hammock when the mercury drops you’ll want to invest in a hammock quilt to stay warm during the night. The best hammock quilts are well-designed and will keep you warm even in the chilliest conditions. As far as hammock insulation types—hammock pads, sleeping bags, top quilts, etc—they are hard to beat. Whatever model you decide on be sure that it is built with high-quality materials and fits your camping hammock snugly to ensure maximal insulation. The last thing you want is to have a draft between you and your quilt causing lost heat. 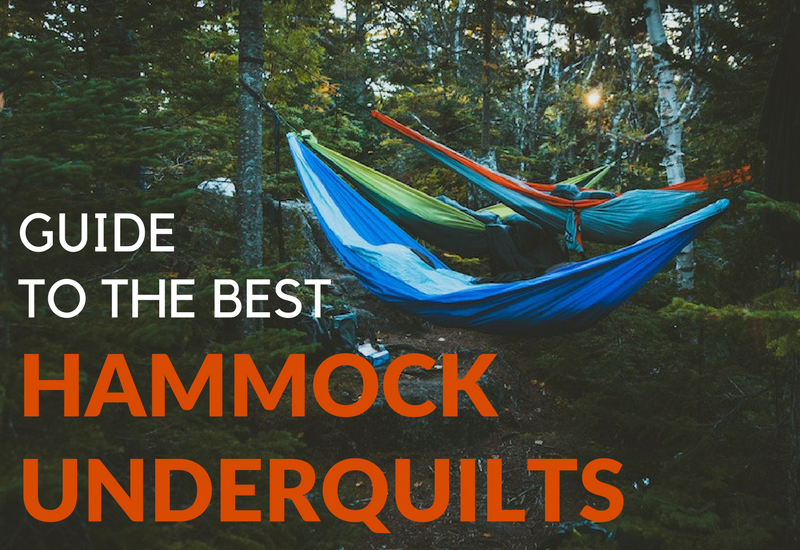 The good news is that in today’s market there are plenty of great hammock underquilt options to choose from and listed here are just a few to choose from. I feel confident that if you go with one of these options you’ll see the huge upgrade of having a nice hammock quilt during cold nights. Check out our other guides to the best insulated water bottle, the best compression socks and other recommended travel products here.